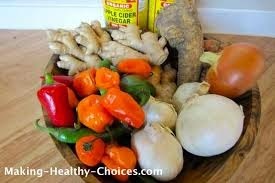 "Let your food be your medicine and your medicine be your food"
What if I told you that you could easily make an inexpensive, powerful, immune-boosting, modern day plague tonic on your kitchen table from herbs and vegetables readily available at most food markets? This tonic is an effective remedy for inflammation, fevers, flu, colds and infections. Plus it is antiviral, antibacterial, anti-fungal and anti-parasitic. After unsuccessfully using the Neti Pot to clear my sinuses of what I thought at the time was a sinus infection, I finally visited my local clinic and learned it was some sort of allergy. However, what they prescribed, a steroid nasal spray, which I took for 2 weeks, made me very sick to my stomach, so I stopped taking it. Then I received a brochure in the mail from Dr. Schulz, whom I have been following for awhile. The brochure mentioned the Master Tonic. Dr. Richard Schultz is an authority on natural healing and herbal medicines, teacher, clinician (over 20 years), author and herbal formulator. He founded clinics in New York, Southern California and Europe. Dr. Schultz explains, "This tonic is extremely powerful because all the ingredients are fresh. Its power should not be underestimated. This formula is a modern day plague tonic and when added to an incurable routine it can cure the most chronic conditions and stubborn diseases. It stimulates maximum blood circulation, while putting the best detoxifying herbs into the blood." Schultz emphasizes, "This formula is not just for the sniffles, it has helped to turn around the deadliest infections like some of the new mutated killer viruses that defy conventional antibiotics." I have been taking this concoction once daily in the morning for about 2 months and while the stuffy nose isn’t completely gone, it is 99% better. My guess it probably won’t completely go away till I move, which I am planning. However, my energy is back and my little brain cells feel more alive and clear. But, so far I have not been disappointed in the results and realize that anything that is taken systemically will probably take about 6 months to a year to fully see how it is changing my health. 1 part fresh chopped cayenne peppers, or the hottest peppers available, i.e., habanero, jalapeno, African Bird or Scotch Bonnets etc. (a great blood stimulant). Close and shake vigorously and top off the vinegar if necessary. Keep the jar in a cool, dark place for 2 weeks or longer. (Can be stored with the drinking glasses so that you will see it and remember to shake daily. Shake the tonic daily a couple of times. Strain liquids from solids after steeping about 2 weeks or however long you let it sit. Filter the mixture through a clean piece of cotton (coffee filter or colander) bottle and then label. May puree the solids and add honey or lemon juice as a sort of dijon or make a salad dressing or marinade for meats. Master Tonic lasts indefinitely at room temperature, after straining. I froze my solids after blending it as is will also last indefinitely in the freezer. Drink 1/2 to 1 ounce two or more times daily (1-2 tbsp.) as a tonic. Gargle and swallow. Don't dilute with water. For ordinary infections, 1 to 2 tbsp. taken 5-6 times a day will deal with most conditions. It can be used during pregnancies, is safe for children using smaller doses and as a food is completely non-toxic.